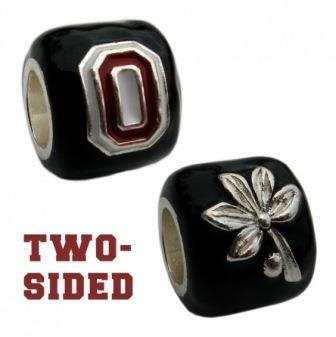 This silver-plated black Ohio State Buckeye Block O and Leaf bead is officially licensed through The Ohio State University. This bead is 100% Made in the USA by American Craftsmen. This stunning unique bead can be arranged on any piece of college jewelry to make an exciting necklace, bracelet or anklet to support The OSU Buckeyes! Who woulda thought? Heaven created the prettiest piece of nature just for our Buckeyes! Show off where you come from with this little Ohio State charm.